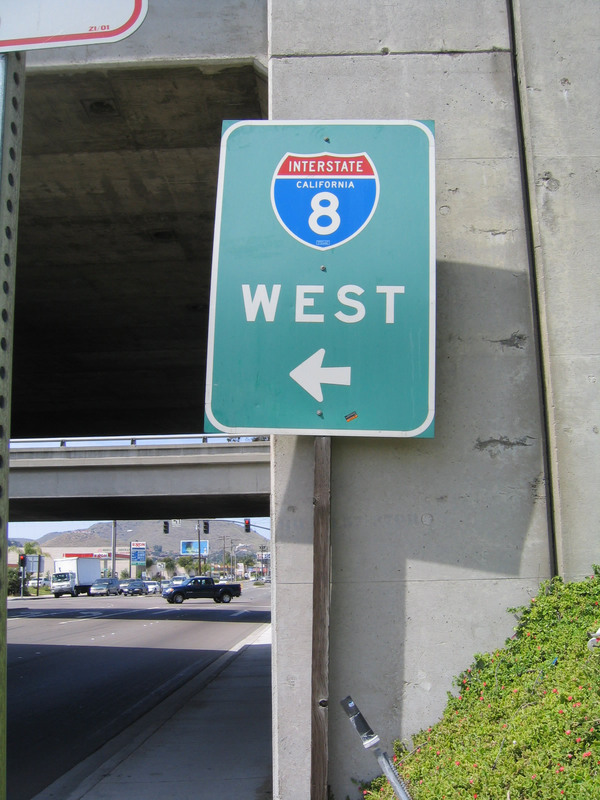 This view of California 60 (Pomona Freeway) looking west is taken from the transition ramp that connects Interstate 710 (Long Beach Freeway) north with California 60 west. Photo taken 05/08/05. 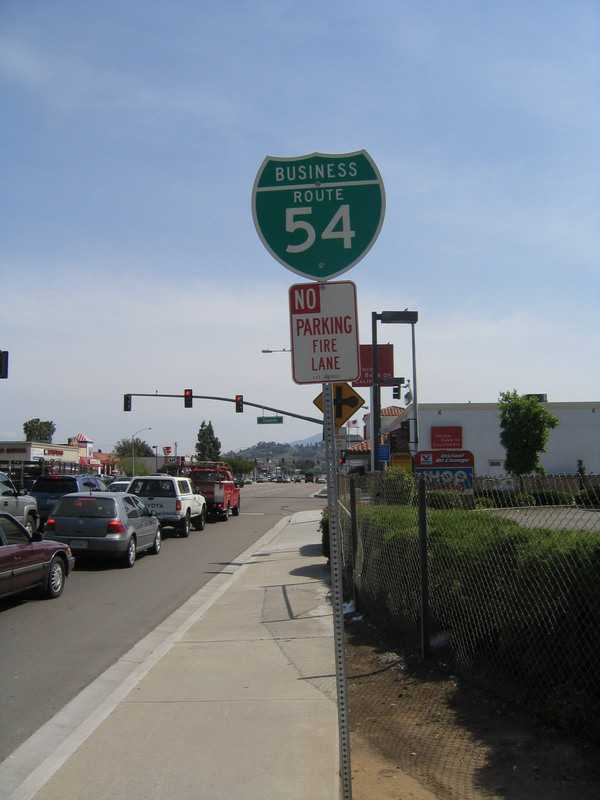 When California 54 within the city limits of El Cajon was decommissioned in 1999, the entire segment of the former state highway was shielded with Interstate California 54 Business shields. 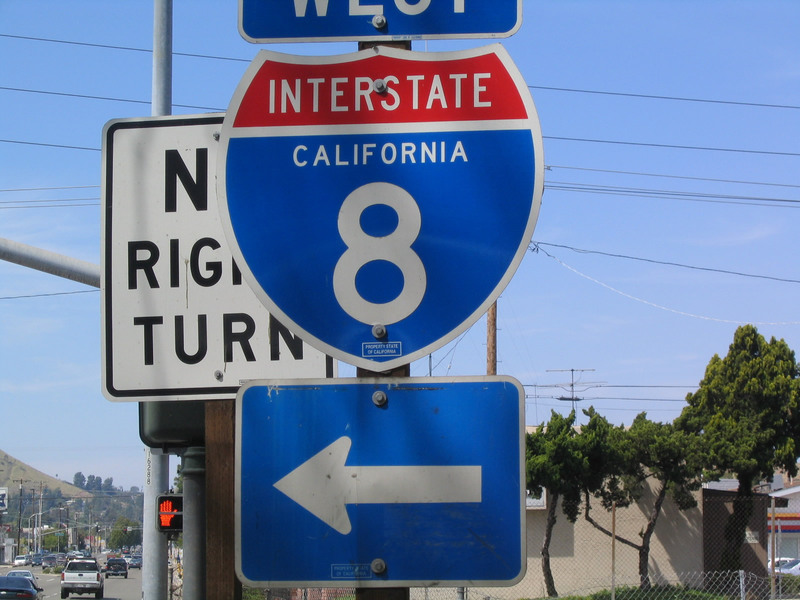 These shields would normally be associated with an Interstate 54, but they were given this number since California 54 was retracted within the city limits. 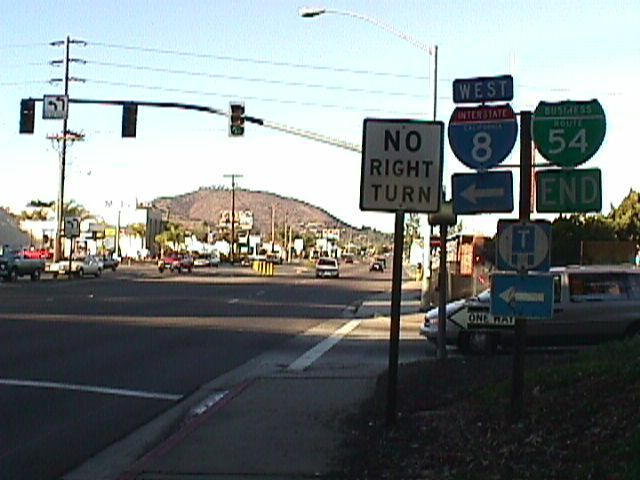 This page shows some of these business route signs that were placed along Second Street in El Cajon, which are clearly the wrong types of shields to be used on what is essentially a city street. It is signed east-west, even though Second Street runs north-south. 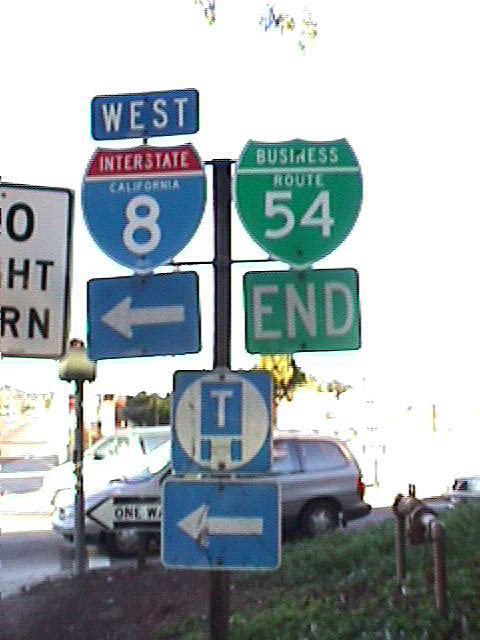 Even though these business route shields have gained notoriety as an oddity and blooper, several of the route markers are still in place as of December 2012. 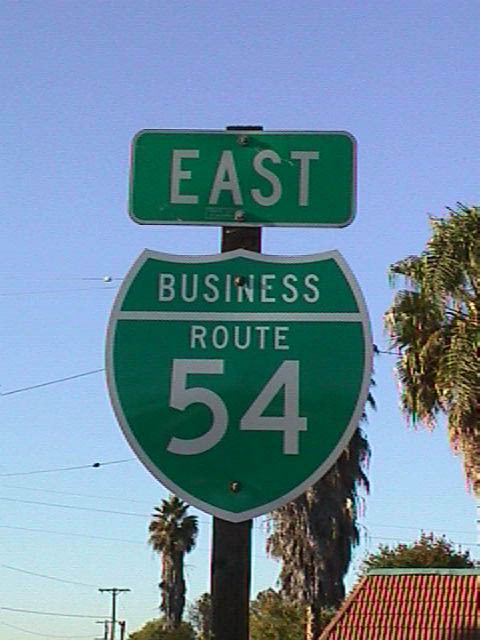 This is the first eastbound (northbound) California 54 Business shield along northbound Second Street near Washington Street in El Cajon. 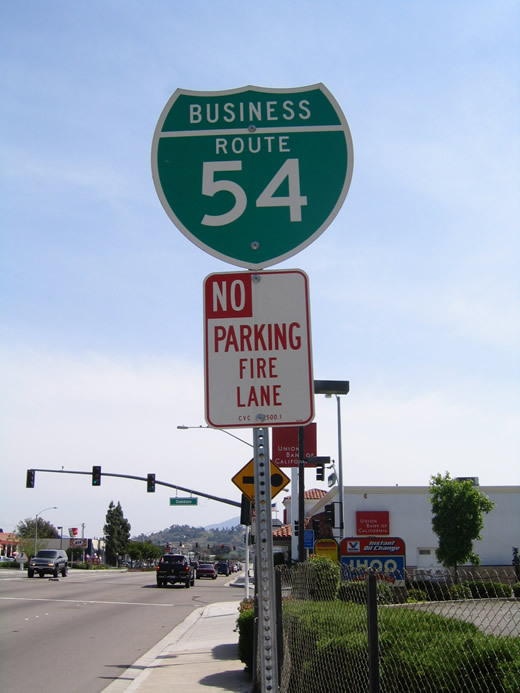 There are no business route shields at the city limits, although there are end and begin California 54 shields present at the city limits. Photos taken 12/12/99. Northbound California 54 Business (Second Street) approaches Interstate 8. 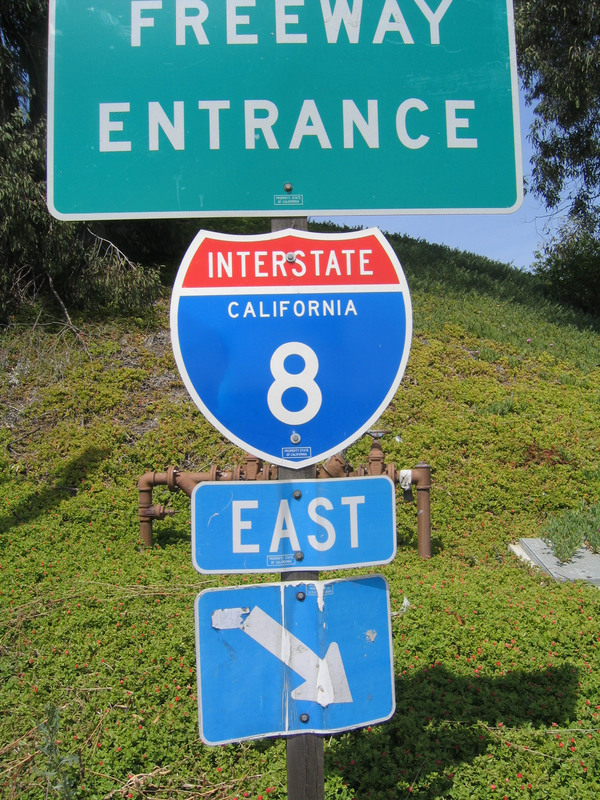 At this diamond interchange, turn right for Interstate 8 east to El Centro or left after passing under the bridge for Interstate 8 west. Photo taken 05/08/05. 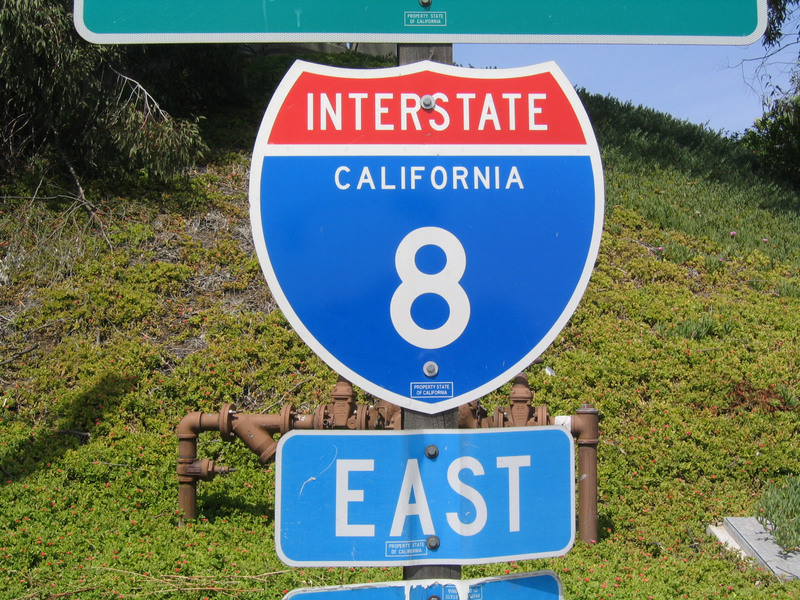 This freeway entrance shield assembly for Interstate 8 east is posted on northbound Second Street. Photos taken 05/08/05. 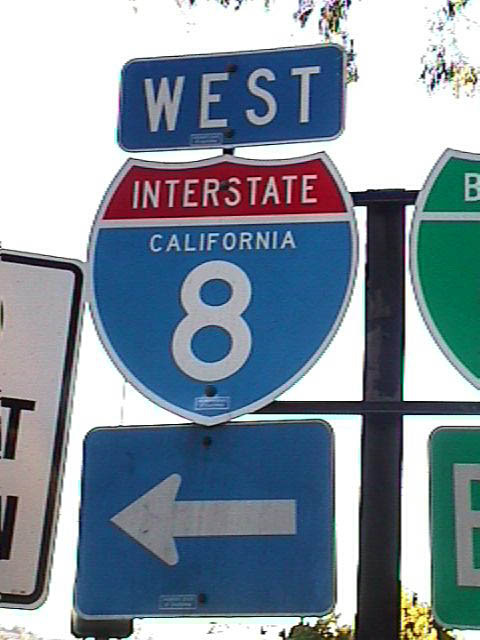 An Interstate 8 west guide sign is posted along northbound California 54 Business (Second Street) after hte ramp to Interstate 8 east. Photo taken 05/08/05. 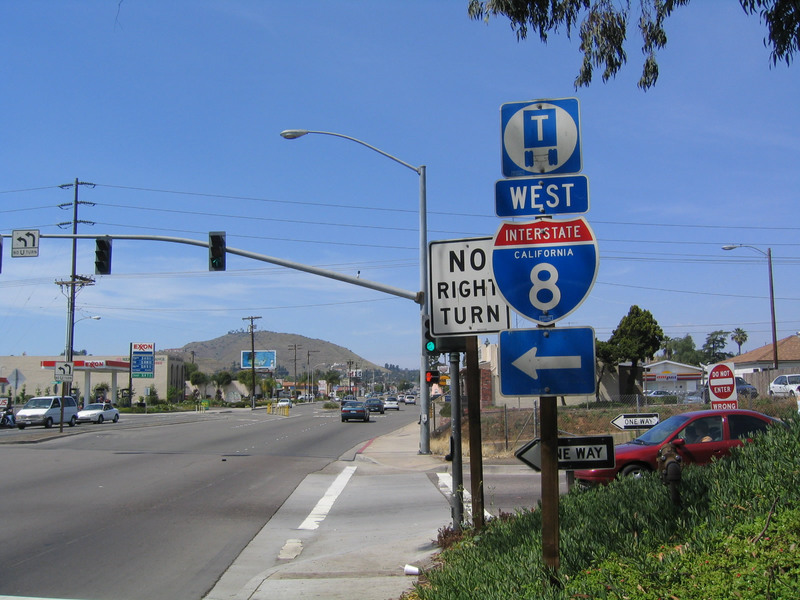 Northbound California 54 Business (Second Street) meets the left turn to the Interstate 8 west on-ramp. Photos taken 05/08/05. 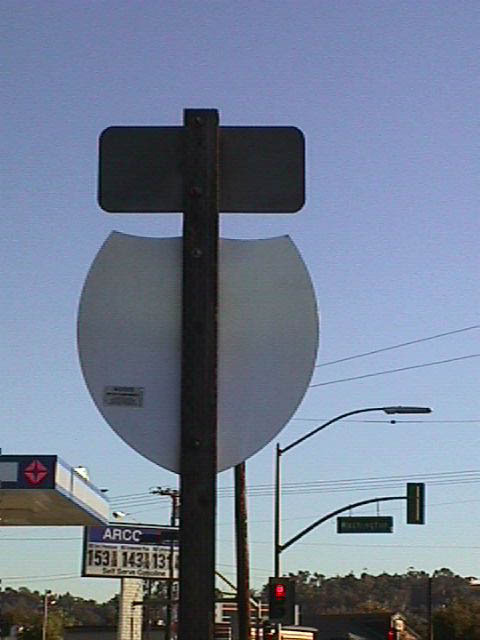 Looking back to 1999, an end shield for California 54 Business was originally posted at the Interstate 8 interchange along northbound Second Street, but it was gone by 2005. 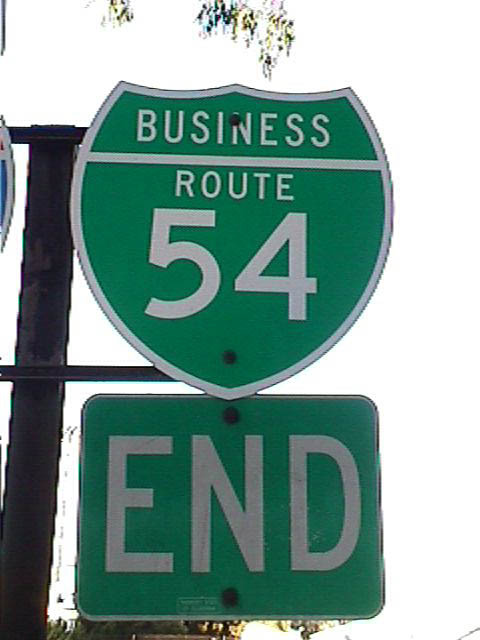 The end banner used to carry a California 54 shield, but that shield was replaced by the Business Route shield. The Interstate 8 shield was kept from when this was a state facility. This is technically also the northern terminus of San Diego County S-17, but there are no shields present for County Route S-17 at any point north of California 94. Photos taken 12/12/99. 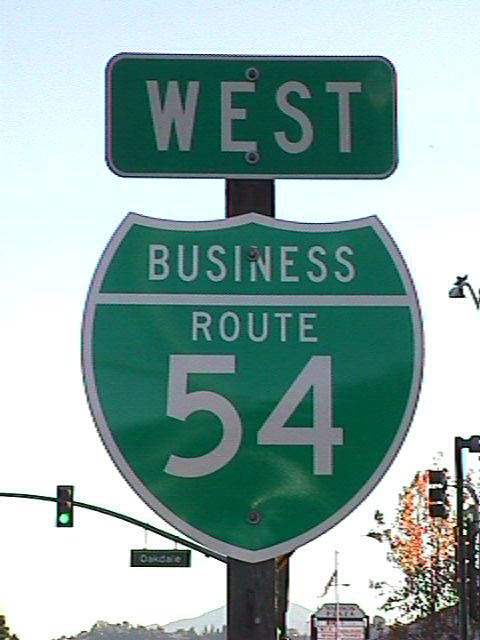 This is the first California 54 Business west (south) route marker. 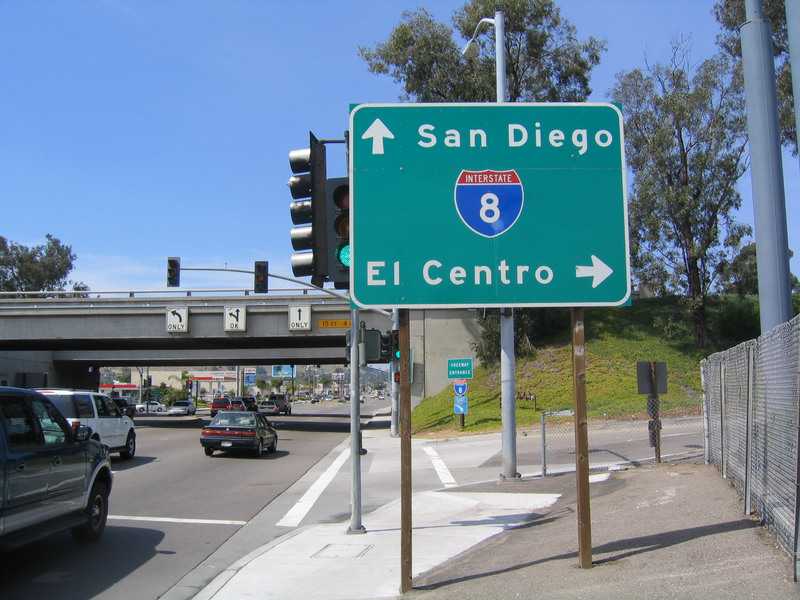 It is posted along southbound Second Street in El Cajon after the Interstate 8 interchange. On the signs on Interstate 8 approaching this exit, none of them mention California 54 Business, and the California 54 shields that used to be on those signs were covered by a green tape. The west banner was in place in 1999 and gone by 2005. Photos taken 05/08/05 and 12/12/99. 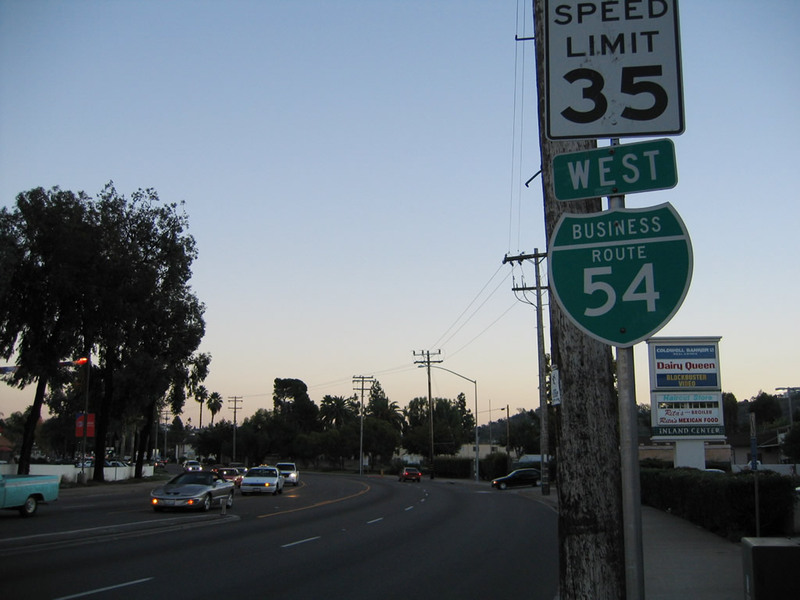 This California 54 Business west reassurance shield assembly is posted along southbound Second Street in El Cajon after the intersection with Main Street (Business Loop I-8). There are no shields for Business Loop I-8 from California 54 Business. Photo taken 11/06/04. Page Updated December 20, 2012.